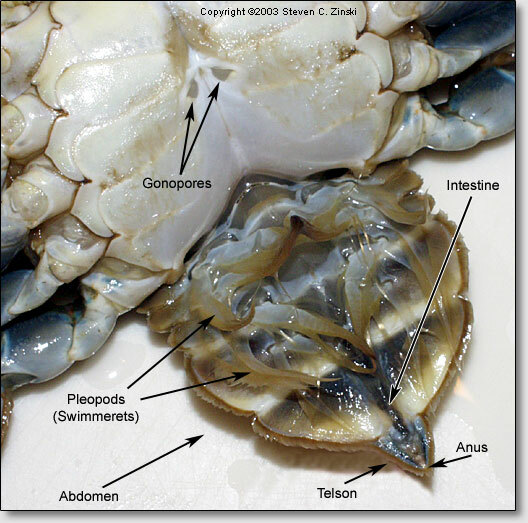 Females have four pairs of pleopods (or swimmerets) on abdominal segments 2 through 5. 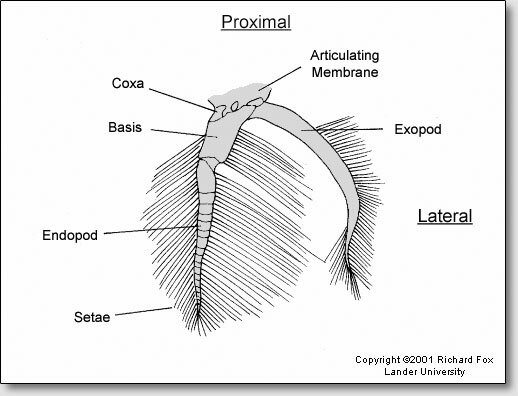 The first article, or coxa, of a pleopod is attached to the body by a soft and flexible articulating membrane (see figure below). The coxa is small and poorly calcified but the next article, the basis, is large and conspicuous. Two rami, the exopod and endopod, arise from the basis. During spawning, egg cells (oocytes) are forced from the ovaries through the seminal receptacles where they are fertilized. The fertilized eggs, which are about 0.25 mm in diameter, are then extruded from the gonopores where they attach to the long setae of the pleopods to form a large, cohesive mass or "sponge" that remains attached until they hatch (i.e., the oocytes attach to setae on the endopodites of the leaf-like swimmerets, or pleopods). The sponge is ventilated by movements of the abdomen and the pleopods. The average sponge contains about two million eggs, but may contain anywhere from 750,000 to 8 million eggs, depending on the size of the female. See the Natural History Museum of Los Angeles County Crustacea Glossary for a detailed definition of terms.